← The Pope is Coming! The Pope is Coming! 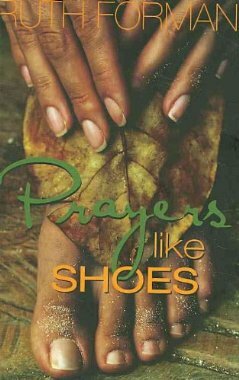 Today’s poems are from Prayers Like Shoes (Whit Press, © 2009 Ruth Forman), and appear here today with permission from the poet. Ruth Forman is the author of three award-winning books: poetry collections We Are the Young Magicians (Beacon, 1993) and Renaissance, (Beacon, 1997) and children’s book, Young Cornrows Callin Out the Moon (Children’s Book Press, 2007). She is the recipient of the Barnard New Women Poets Prize, The Pen Oakland Josephine Miles Literary Award, The Durfee Artist Fellowship, the National Council of Teachers of English Notable Book Award, and recognition by The American Library Association. She provides writing workshops at schools and universities across the country and abroad, and has presented in forums such as the United Nations, the PBS series The United States of Poetry and National Public Radio. Ruth is a former teacher of creative writing with the University of Southern California and June Jordan’s Poetry for the People program at UC Berkeley and an eleven-year faculty member with the VONA-Voices writing program. Also an MFA graduate of the University of Southern California School of Cinema-Television, she frequently collaborates on film, music, dance, theatre, art and media projects. Her latest collection is Prayers Like Shoes (2009) on Whit Press. When not writing and teaching, she practices a passion for martial arts: classical Yang family style tai chi chuan, tai chi sword, bo staff and karate. Ms. Forman currently lives in Washington, DC. Editor’s Note: Today’s feature is more than a book of poetry, it is a gift. When my father passed away I found myself more determined to go on, to function, than to break down and mourn his loss. It was a book of poems that enabled me to weep, to grieve. It is a rare book that allows you to access the real human being who dwells within you, beneath the surface of what you imagine to be your ‘real life.’ This is such a book. On the strong recommendation of a friend I bought Prayers Like Shoes. Because time is a luxury in my life, I began reading it while waiting for the bus. By the time the bus arrived—by the time I reached the bottom of the first page—I was in tears. I read from cover to cover, on bus and train, first on my way into the world, then on my way home again. At times I felt the Woman inside me awaken, celebrate. At times I felt inspired to speak up in the name of peace. I wondered at love, at the nature of man. Throughout—within the delicate, vibrant, intricate fabric of Forman’s weaving—my heart was so close to the surface that the tears fell when they would. I wondered what the people on the bus thought of me with my book of poems and my well of tears, but, mostly I was inspired. I was reminded of what I love in poetry. Experience. Connectivity. Reading someone else’s words and feeling that I am not alone, that I am part of a community, of a human world. That life is beautiful and painful and hard and that it is poetry—honest, vocal, unapologetic, lived, felt, lyric poetry—that makes the living more bearable, that gives us permission to experience emotion while offering us an outlet for the same. I chose the quote above by Gloria Steinem because, first of all, what poet is touted by Gloria Steinem? !, but also because it speaks the truth about this book. I want to give a copy to my mother, to my Sisters, to the people I love and admire who engage with poetry as I do. I will turn to this book when I want to feel, and also when I want to remember why I write poetry. I cannot imagine a greater gift than that. Want to see more by Ruth Forman? This entry was posted in Ruth Forman and tagged American Poetry, Feminist Poetry, Peace Poetry, Poetry, Poetry of Faith, Poetry of Loss, Spiritual Poetry. Bookmark the permalink. Love these poems, which have such resonance for me and my life. They are indeed a gift! Thank you so much for posting them. Sometimes a poem comes thorough as natural as breath. It is a clear transmission from the divine. Thank you Ruth for these poems. Thank you Sivan for posting it, and your response, here. ‘~~~prays for us to speak. afraid of what might happen if we don’t.’ Indeed. Thanks for the introduction, Sivan! As ever your discerning choices, spectacular simplicity and a sense of tears. Reading these I realised I am no poet, and might never have been mother. When words are set like stones by a child the expressing ennobles us all. Its almost all that does! Thank you for a celebration. They make me feel like an Indian Princess, principessa!